We've recently published a video explaining how to use our BAScontrol Toolset. 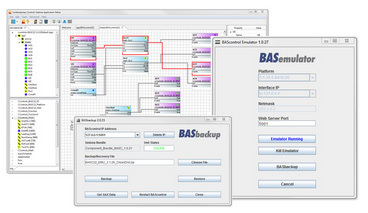 The BAScontrol Toolset includes the Sedona Application Editor (SAE) – a component-based graphical editor for control applications, BASbackup - the BAScontrol Project Utility, and BASemulator – BAScontrol platform emulation on a PC. Provided free of charge on our web site, these tools simplify controller programming and project archiving. All three programs are available as a single install sharing a common Sedona bundle of kits and components. The toolset is all that is needed to commission a BAScontrol or BASpi Sedona platforms. This video provides an overview of how to get started with the toolset quickly, as well as the operation of each tool in the toolset. After watching this video, you will know how to emulate Sedona platforms on your PC, how to open a Sedona SOX connection to real or emulated devices using SAE, and how to backup and restore your project to a file by using BASbackup. This video is a great starting point for anyone using the BAScontrol Toolset.